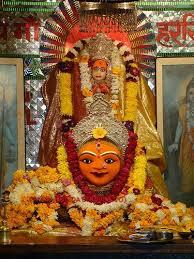 Here is Some Information about Manivedika Temple(Shakti Pith)in Pushkar Rajasthan India. The Manivedika Shakti Pith Temple is located to Sitakunda station of Gayatri hills near Pushkar and 11 km north-west of Ajmer, Rajasthan.This temple is dedicated to Goddess Gayatri (Saraswati) and Sarvananda (form of Lord Shiva)It is believed that Goddess Sati’s two (manivedikas) wrists fell here and thus, it is known by the name of Manivedika Temple. Here, the form of Lord Shiva as a sentinel is Sarvanand.The temple is constructed on a hill and made of stones on which various idols of gods and Goddess are engraved. The art and architecture of the temple is commendable and the huge pillars show the grandness of this holy structure. History to this place dates back in the time when it is said that the Right arm of Maa Sati fell to this place. 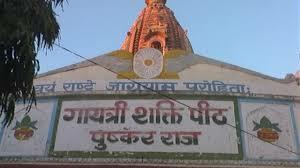 Best information about the origin and the formation of this temple, people can mingle with local people. Navaratri and Durga Puja are celebrated with great fervour. Pushkar Mela (fair) is celebrated popularly amongst people on the banks of Pushkar. The fair is held during Kartik Ekadashi to Karthik Poornima (November) for five days. During the fair, camels are brightly dressed and decorated, camel races are held; song, music, dance is played out and an exhibition is also held which draws people from across the globe. By Road : There are many public and private vehecals available to reach Manivedika Shakti Pith Temple Pushkar Rajasthan. By Train : The Nearest Railway station is pushkar station . By Air : The Nearest Airport is Jaipur Airport.